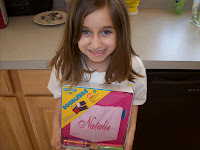 My little girl Natalie recently had the privilege of reviewing an adorable, personalized Doodlebag from Princess Linens. Princess Linens is now officially a licensee of Crayola, so Doodlebagz include fine Crayola crayons and chalks. Natalie now has a trendy bag to carry with her wherever we go. Long wait at the doctor's office? She has all she needs to keep her occupied, all in one bag. Crayons? Check. Paper? Check. Chalk? Check. Chalkboard? Check. She brings it along with her everywhere now and loves to create her own "masterpieces." As for their clothing, well you need only take KATIE HOLMES word for how good it is. Here she is featured in People magazine with her daughter Suri wearing Princess Linen's Camelia Pink and Baby's Breath Trim Garden Princess Dress. The photo also appeared in OK Magazine. And that's not all. Click here to see the numerous press attention Princess Linens has received (including Parents Magazine and Parenting.com). Your child can play doctor in style with the "Dr. (your child's name) on the shirt. I love it! And there's so much more! 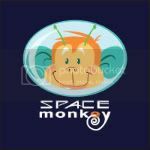 Like luxury baby clothes, big brother gifts, big sister gifts, personalized bibs, personalized burp pads, crayon aprons, and chalkboard placemats. Thanks to the generosity of Princess Linens, readers of So a Blonde Walks Into a Review can save 15% off their entire purchase! 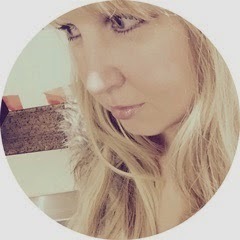 Simply enter the code "Blonde" (without the quotes) when checking out to receive your discount. 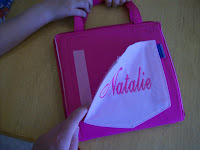 Princess Linens is also giving away a personalized Doodlebag to one lucky reader!! To enter, simply visit Princess Linens, then leave a comment here letting me know what your favorite product is and why. For a bonus entry, blog about this contest on your site and leave a separate comment here with your link. Deadline to enter is Monday, July 28 at 11:59 EST. Contest open to U.S. residents only. Winner has two weeks from the time of notification to claim prize, or the prize will be forfeited. The Garden Princess Dress in Green Hibiscus & Camellia Trim is my favorite item offered by Princess Linens. I love the color combination and the classic styling. It is just darling. The solid pink apron because my daughter said she loved it. I really like the Bon Bon Corduroy Dresses. But honestly, it is all perfect. Thanks so much for the chance. I think the Bon Bon Corduroy Dresses are darling. I have a little princess that would look adorable in the pink apron. Thanks for the chance. the my first scrubs are adorable. as are many other things on the site. thank you! This would be great for my little girl. Thanks for the contest. My daughter, the budding artist, would love the crayola doodlekit. What a wonderful prize. 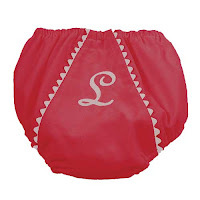 And, the monogrammed diaper covers are a hoot. . . I just wish I still had some one in diapers! I really like the striped crayola apron. Very cute. pretty and perfect for my niece Autumn! My little girl would love to win this! I like the Baby Pink and Chocolate BonBon dress. Very sweet with the initials. The garden princess dress is just lovely. I love the orchid and Camellia trim garden princess dress cause it would look adorable on my little girl! Thanks for the great giveaway! The Pink Stripe Chalk Talk would be great! I love the idea! I love the crayon keepers! My favorites are the pink stripe and Red and Blue. really love the pink stripe crayon keeper! it'd be perfect for travel! I love the garden princess dress! It would look so cute with her monogram on it! I love the baby scrubs. So cute! Oh my goodness the crayon tool belt is just too cute! i like the personalized scrubs because i am a nurse. I love the pink and chocolate Bonbon dress. It's classic, beautiful and something that would stand out in a crowd! It's also perfect for winter with a long sleeve shirt and some Baby legs! The crayon toolbelt and the crayola doodlekit are my faves. My daughter is addicted to crayons and markers. Thanks so much for the opportunity. I like the scrubs! I think this bag is pretty clever! The Crayon Aprons are really cute. Oooh, I adore the pink & chocolate Bon Bon dress! What a great site! the scrubs are hilarious. grandpa is a doctor, so that would be pretty cute. but the pink stripe doodlebag is such a great item. I like the red and blue crayon keeper because my son loves to color in the car, at restaurants, etc. and it would be so convenient and cute too! I love the Crayon Keeper! I love the blue/red and camo doodlebagz, but I also love the blue chalk talk chalkboard placemat! I love the pink Chef Apron & Hat Set. So many cute things, but I love the Garden Princess Dress in Orchid with Camellia Trim -- so sweet! I just love the garden princess dress in white with orchid pink trim, this is really beautiful! The scrubs are adorable too. Hi! I just added this giveaway to today's best blog contests on my blog!! I love the Chalkboard placemat. That would be so useful when we take our kids to restaurants. It would definitely keep the kids entertained without the waste of the crappy crayons that they give us, but we always wind up breaking and/or throwing out. The garden princess in fern green is a beautiful dress. This would be a cute dress for a summer party. The Chef Apron and Hat Set would be perfect for my kids! They are 2 and 4 and love helping me in the kitchen! I love the striped Apron! That is so cool! I LOVE the Bon Bon Holly Berries Corduroy Dress! How cute would that be for Christmas! My youngest step-daughter would love this bag. My favorite item is the lab green 'My First Scrubs'. Too adorable! I love the scrubs. They are an easy and comfortable Halloween costume. I love the Bon Bon Holly Berries Corduroy Dress. It is so pretty and feminine. I love the Pink Stripe crayon apron. I like the Garden Princess Dress in Orchid with Camellia Trim. It is such a sweet little dress and would be easy to put on a squirmy toddler. I love the Chef's Apron and Hat set. So adorable for our little kitchen helper. Thanks! I love the Garden Princess Dress with Midnight Pansy Trim. I love the Crayon Keepers. How wonderful are they? I hate it when crayons get thrown in boxes, left on the floor to be stepped on. I can also see how it would help with hand/eye coordination, slipping those crayons in and out of their slots. I'm a fan, but I'm torn between the pink stripe and the pink camo Crayon Keepers. I think the clothing is really cute, but right now, I think my favorite is the Doodlebag! This would be perfect for my daughter who is learning to scribble, and LOVES it. It would be so nice to have everything right there, and have a spot for everything. I don't have to dig through my diaper bag, hoping that I have a scrap piece of paper or a pen somewhere that can keep her happy. I would just have to grab the bag! I seriously need this bag! I love the Doodlebugz™ Crayola Crayon Apron-Pink Striped. I wish it came in my size. What a great idea. I love that kids can be creative and personalize things. I like the no more blues blue scrubs. I like the Camo Crayon Keeper. It would be great for taking in the car, to church or when we visit my Mom. The pattern would hold up well and both my son and daughter could share it. I love the ballerina onesies because I think that would just look too cute on a little baby girl! My fave is the Lavender Ballerina Bodysuit. Too cute!! My favorite has gotta be the scrubs - so cute! I like 'the dress Suri Cruise wore'. Adorable! Great giveaway, thanks. What cute idears! I love the scrubs, they are so neat. Pink of course for my great granddaughters. The giveaway item would be ideal for Jade to take to church to keep her intrest during the worship service. She sits well when she has something to do quitely. I love the Chef Apron and hat set. My little one loves to help me cook and this is a perfect suprise for her! I love the orchid and Camellia Trim Garden Princess Dress and the Scrubs in Pink are too cute! Thanks for a great giveaway! My fav is the Garden Princess in Camellia with Baby's Breath Trim. It just a beautifully simple, precious dress and would look gorgeous on my little Diva! Doodlebagz in Green Camo! I love love love it! My son would too! I love the solid pink (for my niece) and the blue and red (for my nephew) Doodlebuz bags. These are perfect for the little one and their drawing supplies. I love the crayon keepers. I love the garden princess dress in Orchid with Camellia trim. love the baby scrubs - perfect for boy or girl!! i love the Soft Sand & Chocolat bon bon dress. I love the bon bon dresses because they are not trendy, they just look like a little girl's dress should. My favorite item is the Bon Bon Chocolat Corduroy Dress with Baby Blue Trim because its just so beautiful. I love thier Doodlebugz Crayola Toolbelt for crayons. My daughter would love this! The crayon toolbelt is too cute! I love the crayon keepers! I have one and the kids absolutely love it. It's so easy for us to tote n go! the chefs hat and apron set are my fav! How cute! I love the Ballerina Onezies! They are so adorable! The Doodlebags are such a great idea! I love the Bon Bon John Johns! The doodlebagz are so neat, the camo would be best for my little guy. My daughter wants a doodlebag BAD now that she's seen it! I'm in love with that crayon apron! How cute is that?! 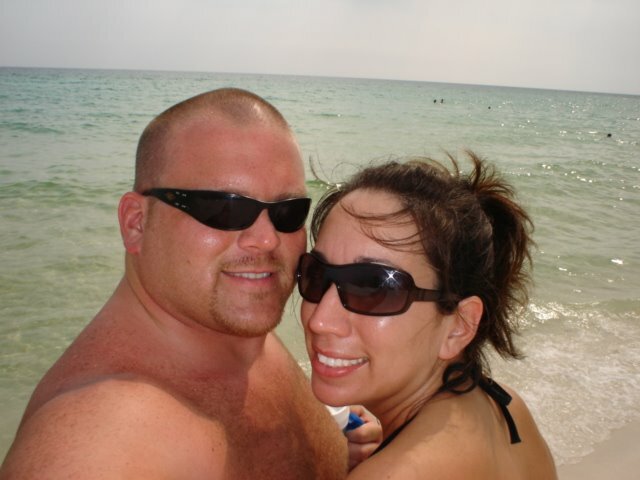 I also posted a blog entry with a link to you. I absolutely love the garden princess dress in Midnight Pansy!! It is really hard to choose, but the Bon Bon Corduroy Dress in Chocolat & Baby Pink really caught my eye!!! I like the Orchid Pink Garden Princess Dress!!! How Precious!! Love the Bon Bon Chocolat Corduroy Dress with Pink Trim! Garden Princess in Camellia and Baby's Breath Trim, just cause it's so cute and pink! The pink strip doodlebad is perfect for any young artist! I love the first scrubs, doodlebags and the crayola keepers. The scrubs are absolutely adorable! 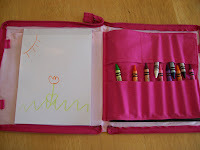 I love the cute style and functionality of the doodlebags and crayola keepers. The pink stripe is adorable, but I think the name shows up best on the solid fabric. Thanks for the info and the contest! I love the chocolate and Baby pink Bon Bon Corduroy dress. Thank you!! My fav item is the chef hat and apron. Last week my son asked me for a chef hat and I said NO because I didn't know where to get one....now I know! I like Garden Princess Dress with Midnight Pansy Trim. This will look wonderful on my goddaughter. I like the bon bon dress. I love the Bon Bon Holly Berries Corduroy Dress! Adorable! I love the littlescrubs, because then I could take a matching picture with Daddy! It would be too cute! I love the My First Scrubs Shirt and Pant Set. 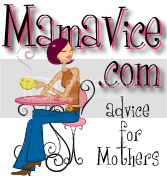 It would be great for my nephew whose mother is pregnant right now. My favorite is the personalized Garden Princess dress in orchid & camilla -- SO adorable! Princess Linens has adorable things, love the scrubs!!! Oh heavens so many things to love. I cannot chose just one item. I would be buying lots of things for my daughters stepdaughter. I love the doodlebug bags and know she would. She is a doll and I'd love to dress her up in the dresses. I am a fan of the crayon-keepers, because my daughter is constantly adding to her coloring collection and is in need of containers to pack her crayons in. I love the personalized Crayon Keepers. My daughter is a crayon fanatic and would just love it. 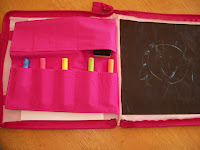 I like the Pink Stripe crayon keeper because it's a stylish way to keep track of crayons. scrubs costume is a wonderful idea. I think my favorite is the PINK CAMO Doodlebag! 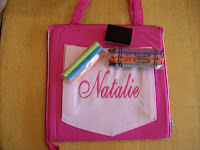 The Doodlebugz Crayola Crayon Dufflebag- Red and Blue is also a very good idea! Thanks for the opportunity to participate in this fun giveaway! 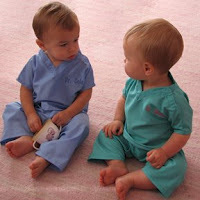 I love the scrubs and the little Hamptons overalls- too cute!! I'm a sucker for anything decorated with ricrac, so I love the Bon Bon Corduroy dress in baby blue. My daughter would look adorable in the orchid Garden Princess dress, it's so cute! However, she would really love the Doodlebag, perfect for traveling on vacation or just short trips in the car. I think the Chef Apron and Hat Set is so adorable! My girls are always wanting to help me cook and bake, so I would love to win this for them :) Thanks! I love the personalized scrubs. I love the my first scubs. Tooo cute for words. Hampton's Boys Overalls - ery very cute- I love the scrubs too! I like the crayon keepers...perfect for keeping them off the carpet, couch, etc. !